I can’t believe how quick kids grow up. I believe it now when people say that all you need to do is have kids and they will grow up; you don’t even remember how time flies by. 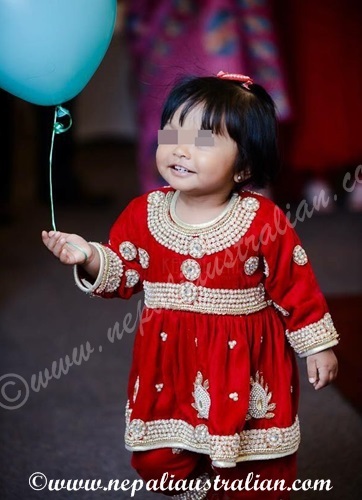 Chhori is 16 months now and she constantly manages to surprise us. These days, she wants to eat her own meal. So she sits in her chair, she can strap herself in if she wants to and then waits for the tray to be put on the chair. Then she patiently waits for her food. Once the food is on the tray, she wants a fork and she feeds herself. It is so cute to watch her eat. I have to admit, she might grow up to be a patient one unlike her mum. It sometimes takes her few attempts to get her food on the fork but she is very persistent and keeps going until she has them on her fork. There were times when she got frustrated and threw her fork but she is getting better at it. She loves her independence. It is easier for us as well. If there is food she can eat using a fork, like meat, pasta, noodles, veggies, fruits, we cut them into small pieces and give it to her and she will eat it all. Of course, she makes a mess as well but it is all a learning process. I still haven’t given her rice and lito as she is not very good with a spoon and only 50% goes into her mouth. So that will be our next goal once she masters the fork. But we still are quite proud parents. She also managed to surprise me with her dancing. From very early on she has managed to copy the actions from the rhymes on Youtube but this one was very special. I didn’t know that AS was teaching her but he asked me to come to the living area on the weekend. Chhori was doing all the right action and the best and cutest part was when she was turning around, doing the full circle. She is doing it so well and I am so happy to watch. This father-daughter team means a world to me for sure. I am sure every kid goes through this phase and every parent has these happy moments. Please share yours and let me know what I can look forward to :). 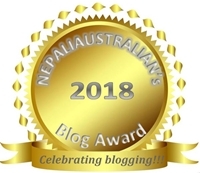 This entry was posted in Being Mum, Our daughter and tagged Australia, australian, australian nepali, baby, cute baby, kids growing, M from nepaliaustralian, mum, Nepal, Nepalese, Nepali, nepali food, new mum. Bookmark the permalink. Hi M, so nice to be catching up on your blog after a long time. Chori is too cute and surely growing up too fast. I have a son too now, how time flies. Actually I wanted to ask you something. My son naps poorly during the day. He is six month plus now, he refused bottle and I had low supply so he was on cereal/lito since 4.5 months. I wanted to know how many times did you feed chori at sixth month and what. I really want him to nap better but so exhausted trying. First of all big congratulation and sorry for late reply. I was luck to have good milk supply when Chhori was small so I breastfeed her 3 times a day along with 3 meals of solid food. If you don’t have enough milk, feed him more solid. I found that if it is possible, when the baby naps and wakes up for the first time (it was around 30 minutes for Chhori), let someone else other than you put him back to sleep. It worked with my daughter. Chhori was not great at nap either but she did nap 2-3 times a day. Hope it will help. Every baby is different and things gets better as they grow up so don’t stress too much. Thanks, my baby does nap 2-3 times but they are short anywhere from 30 mins to 1.5 hrs. I feed him solids three times and bm three times as well when he goes to sleep and when he wakes up. I guess some babies are more active and likes to nap less :). I was just wondering whether or not to feed him solids more than 3 times a day as there are so many mixed suggestions, also when did you start feeding chori jaulo. My baby is 6.5 months and I haven’t started it yet. I started jaulo with Chhori when she was 5 months. I made in pressure cooker and very runny so it was like puree and she loved it. I used to grind them until she was around 8 months. I am sure you are OK to feed him now. Make sure it is not grainy as they might choke. Also give him homemade apple, carrot or broccoli puree. He will love them. So lovely to remember all those precious moments and so great you will have this record of them. Congrats! Don’t forget to come visit my blog today!